Caroline Shaw is Assistant Professor of History at Bates College. She is the author of "Britannia's Embrace: Modern Humanitarianism and the Imperial Origins of Refugee Relief" (OUP, 2015). This post originally appeared on the OUPBlog. Benjamin West (1738-1820), John Eardley Wilmot, Oil on Canvas, 1812. Public domain via the Paul Mellon Collection at The Yale Center for British Art, New Haven, CT. In 1812 Benjamin West completed his portrait of John Eardley Wilmot. 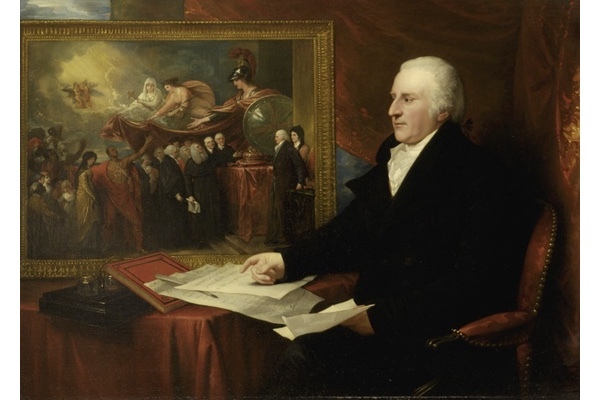 The portrait was two paintings in one: it depicted its subject, Wilmot, lawyer and former Chief Justice of Common Pleas, at the foreground; in the background was a painting within a painting, a scene of American loyalists, including Native Americans, African slaves, women, and children. The refugees were met with the judicious relief of British magistrates, a process overseen by the allegorical Britannia herself, accompanied by guardian angels, even the Virgin Mary. By 1812, when West finished his portrait, the British prided themselves on the welcome they had provided to refugees of all sorts. For the Wilmots, refugee relief was a family vocation. John Eardley Wilmot directed governmental relief efforts in the wake of the American Revolution. His son, John Wilmot, assisted with loyalist relief and went on to oversee official aid for French Catholic Clergy and Laity at the height of the Revolutionary Terror of the 1790s. British concern for the persecuted trumped divisions of race and of religion. Few could have anticipated that the British would set aside deep-set confessional prejudices, let alone that they would go so far as to call the relief of French Catholic refugees a “national duty,” as famed novelist Frances Burney wrote of the campaign on their behalf. Until the late eighteenth century, stridently Protestant Britain saw refugee relief as part of a confessional battle. The Huguenots, Protestants banished from France by Louis XIV, found shelter in Britain and other Protestant countries and introduced the term “refugee” into the English language around 1685. That the British would admit, let alone celebrate, the protection of French Catholics represented a fundamental shift. Refuge would no longer be about religion, but about ideology, about a shared liberal vision of the world, one that transcended deep political divisions within Britain itself. At the time, Britain stood alone in her openness to foreign refugees. By the dawn of the twentieth century, humanitarians across the globe fought for the relief of refugees of all stripes. It is this shift from confession to politics, from particular to potentially universal, that we are now seeing reversed in the Islamophobic backlash against Syrian refugees. In a New York Magazine op-ed, Jonathan Chait pinpointed the conflation of jihadist terrorist and Muslim in Republican rhetoric even before Donald Trump took this scaremongering to an extreme. While Trump offers an extreme case, the fear he stokes has taken root in and outside of politics. The violent rhetoric has begun to incite anti-Muslim violence on both sides of the Atlantic. Mosques in the US have received threats. A London mosque was the target of an attempted arson attack last week. As many dismayed foreign policy observers have remarked, Islamophobia plays into precisely the strident religious hostilities ISIS aims to foster. Islamophobia flies in the face of modern ethical norms which, since the end of the eighteenth century, form the basis by which we discern the boundaries between the persecuted and the perpetrators, providing what succor we can to the victims, our ideological allies. The past is not, as many would claim, a foreign country. Fear of domestic and foreign terror was palpable in 1790s Britain, too. It was not a foregone conclusion that John Wilmot and his committee would be successful in efforts to nationalize concern for foreign refugees, French Catholics especially. How could the British be certain that the foreigners entering from France were not radical Jacobins, wolves in sheep’s clothing? In Parliament, conservative politicians crafted the first Aliens Bill in 1792 with the aim of better vetting in-coming foreigners. Edmund Burke, whose anxiety about the French Revolution predated the Terror, reportedly brandished a dagger to accentuate the dangers of the revolutionaries’ attack on traditional institutions. Yet, this existential fear, real as it was for the British in a moment of domestic discontent and rising Irish nationalism, did not touch refugees. Proponents of the Aliens Bill argued that the policy would better enable the government to identify and aid refugees. Burke himself established a school for French refugee children. He was, from the first, a spokesperson for philanthropic efforts to aid these particular foreigners, a set of public responses that would ultimately coalesce around Wilmot’s committee, which disbursed funds from the Treasury. Asylum in Britain was far from perfect. If the 1790s brought a break in the confessional mode, it did not put an end to popular anti-Catholicism. Fear of popular backlash meant that less illustrious émigré priests lived sequestered lives, housed in barracks the conditions of which were only marginally better than that of asylum-seeker detention centers today. Still, the question for officials and philanthropists in the 1790s was not whether to provide for Catholic refugees, but how to provide for Catholic refugees and to do so in a way that recognized their shared humanity. Relief for French Catholics would remain a source of intense national pride late in the nineteenth century, indicative of a moment when Britain, still imperfect, became modern. To allow Islamophobia to redefine asylum as dependent on religious confession would be to return to the world of rampant anti-Catholicism of early modern Britain, a world still engulfed in the strife of the Reformation. The Rohingya ethnic group of Myanmar, the men, women, and children fleeing ISIS in Syria, those suffering at the hands of Boko-Haram in Nigeria—they, among millions of other persecuted peoples around the world, are our ideological comrades in a fight against terror just as tens of thousands of men, women, and children in France were when confronting the terror of Robespierre’s Jacobin government 220 years ago.